DURBUY AND SAINT AMOUR BELLEVUE WERE TWINNED IN 1968 AND A FRIENDSHIP HAS BONDED THE INHABITANTS EVER SINCE. From the beginning the twinning focused on trade partnerships. Wine makers and artisans promote their products which means that Belgian and foreign tourists in Durbuy, are able to find all vintages of the Cru Saint Amour in hotels, restaurants and shops. Similarly, tourists in Saint Amour can enjoy chocolates and jams, produced in Durbuy. Beyond trade links, friendships have developed within the successive municipal teams and inhabitants. 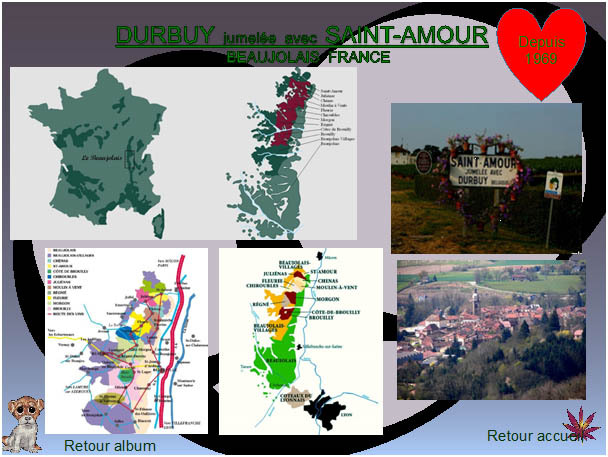 Every five years, exchange visits are organised between Durbuy and Saint-Amour-Bellevue. THE NEXT MEETING IS THE 50TH ANNIVERSARY OF THE TWINNING WHICH WILL TAKE PLACE IN 2018 IN SAINT-AMOUR-BELLEVUE.